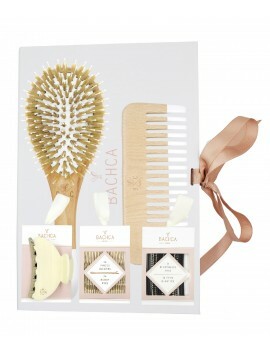 Natural wooden hair brush, perfect for detangling and smooting thanks to the nylon and boar bristles combination. Suitable for fine, straight or dry hair. The boar bristle combined with the nylon pins detangle while smoothing the hair. Natural wooden hair brush, perfect for detangling hair with ease, even when wet. Suitable for curly, thick or oily hair.